In the spirit of my first post, I thought it would be fun to see another before and after in the form of one of our summer projects, the eco-roof above the overhang on our detached garage. 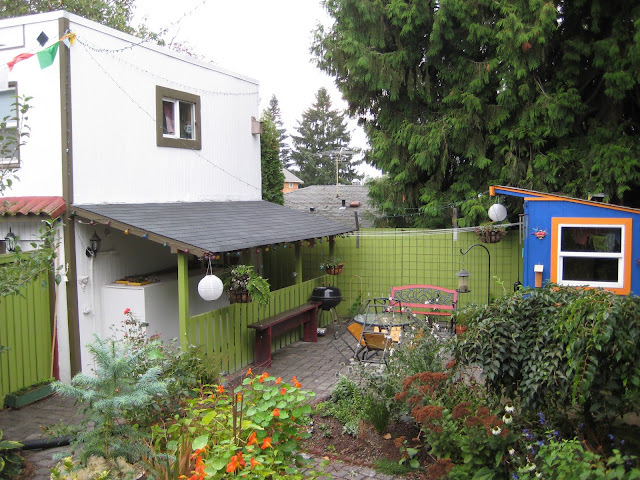 Ugly asphalt tiles was our view...we imagined a greener one.The project was in our heads for a couple of years, we did some research via the Portland Ecoroof Program and modeled ours after several examples of residential small projects on the site. So David went to work! The first layer is a pond liner purchased at Portland Nursery. Then on top of that went the frame David built from cedar. Then filter fabric and some netting went on top.The frame was attached to the roof with brackets and screws. David placing the "growing media". We purchased the specialized blend of dirt (ok, growing media) from Sunmark Environmental . Opening one bag at a time and dumping it, I worked from left to right, back of roof to front, planting as I went. Once it's planted, it was difficult to go back and change things and walk on the surface. The finished roof! About 20 hours of our time for the finished product, well worth it. Finished roof three weeks in. After a month and some Japanese blood grass. Blood grass and sedums start to fill in, looking forward to the grasses filling in, they are so lovely backlit by the sun. So I have to say, we had extra materials and what to do with some extra pond liner? ANOTHER ECO ROOF! That one is on top of our blue shed and cannot be seen as we see this one. Another post, another time. 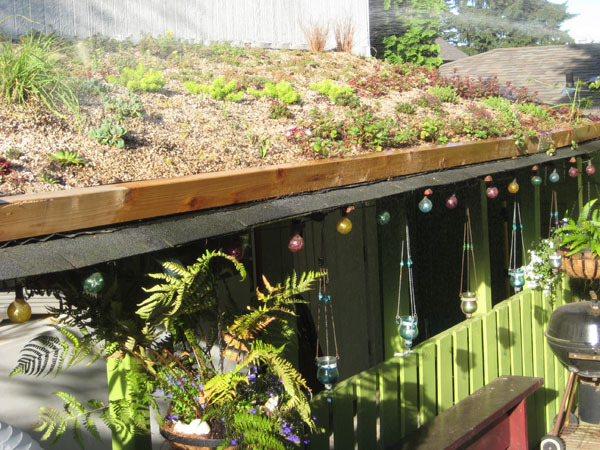 Benefits of eco-roofs: They manage storm water, protect streams, cool cities and clean the air, conserve energy, save money and provide habitat for beneficial insects and birds. But mostly, they just look cool and hey, it's an excuse to plant more! We also feel it visually balances the back garden. 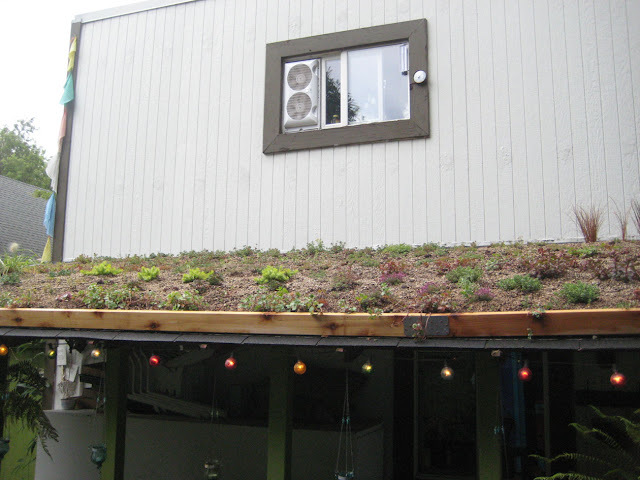 For more information about eco-roofs and resournces, check out the Portland Ecoroof Program or the Ecoroof Handbook. Thanks for joining me, as the ecoroof grows and fills in, I will surely post more photos. Enjoy! I love that you list the plants! Looking good! Ugly asphalt tiles vs. plants...yes indeed a much better view! And of course I appreciate that you called out the fact it's also an excuse to plant more. Any concerns about extra weight on the roof? Regarding extra weight, we were concerned and did some research. There are weight specs for the soil so we could calculate total soil weight, plus we had an engineering friend review our construction. All is fine, plus David added three extra supports to the load-bearing part of the supporting fence. So, apparently unless we have some epic snow storm with 4' of snow, we're good! First of all...YAY for your starting your blog!!! Secondly, I love your green roof...and I'll probably be asking your advice if we ever get our act together and attempt one on our shed. 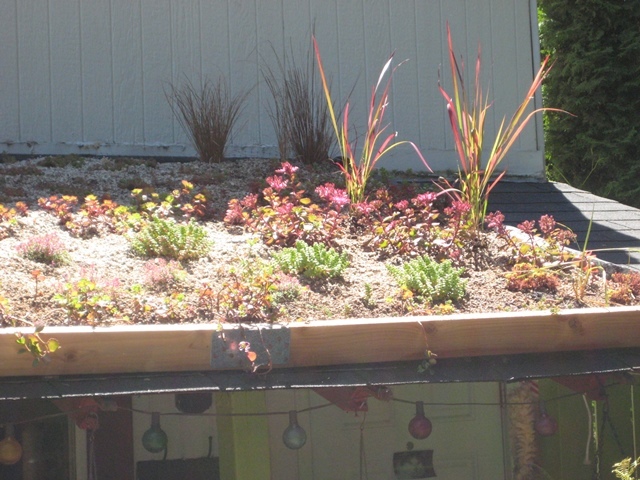 Once I saw those Imperata and Pennistum villosum, I was like "OMG...now I REALLY want a green roof!" Thank you Scott! As I mentioned earlier, it was SUCH a pleasure meeting you both. Yes, if you ever do decide on an eco roof we can give you lists of resources and go into more detail about the steps, happy to do so for anyone! We're learning still, so there may be amendments to our eco roof report in the end. Hopefully the plants will all survive, but if not we will learn and replant! Come by any time for a visit and thanks for the kind words ! I really appreciate all the encouragement. Cheers! Yay! Thank you so much! I will be sure to check out your blog too. An eco roof one day? yes! It was an adventure and really a lot of fun in the end. As I said, the more plants the better - an eco roof is just one more excuse to plant more! I love green roofs! I don't have quite the right setup for one at my house, but look on with slight jealousy when I see them "in the wild". Yours looks so well thought out, I'm sure it will be a source of pleasure for years to come. And it seems less common to see grasses used: they are beautiful up there where they catch the sun! Hi MulchMaid! So nice of you to drop by! I love your blog, by the way. The grasses so far are my favorite, it's a bit of an experiment to see if they survive - so far so good and I LOVE they way they are backlit by the sun. Come by any time if you ever want to see it in person, we're having another open garden through the HPSO Monday evening September 9 from 4-7. Thanks for checking in! cheers! A new voice is added to our growing blogging chorus. I predict sweet music ahead. Thank you Ricki! And thanks for looking! I was not aware of your blog but now I am and will follow you. That is a great project and such an improvement! Kudos to you and David. We love it and enjoy it every day, to be sure. Hi Matt! Thanks for visiting my blog. You bet, would be happy to provide feedback - let me know how to reach you. We felt really lucky it was so easy to do - probably so easy because we live in an area with many resources. We are most grateful for that. The hardest part was tracking down some growing media, but once we got ahold of Sunmark it was easy. Great! I'm at matt.burlin@portlandoregon.gov. Thanks!